Shane Sutherland gets to the ball ahead of James Dale. 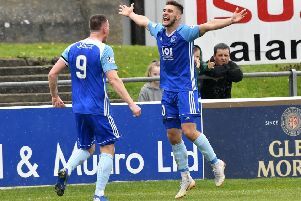 Peterhead moved smoothly into round two of the Petrofac Training Cup with a win as comprehensive as the scoreline would suggest. Indeed, if it hadn’t been for the first half heroics of Brechin’s Graeme Smith, namesake of the Blue Toon stopper, then the result would have been considerably more impressive. Jim McInally started with the same 11 that had beaten Aberdeen the previous week and with a youthful bench to call on, never gave their hosts a moments peace with an attacking display from start to finish. Star man for the visitors had to be Rory McAllister who once again looks like he is going to be key to any success the Blue Toon will have this season. After just three minutes he cut in from the right side of the penalty area but just over ran the ball as he was about to shoot. He then stung the hands of Smith with a powershot shot and the writing was already on the wall for City. Under new boss Darren Dods, Brechin had a couple of early half chances, one of which saw Dods himself slide a decent chance over, but that apart the home side looks like a team in the throws of re-building. Peterhead continued to push forward and should have gone in at the break comfortably in front. In the 28th minute a superb curling free kick from McAllister produced a magnificent save by the right post from Smith who then denied Nicky Riley from the rebound. Nine minutes later Jamie Stevenson did likewise this time from a free kick out on the left but Smith was equal to it with a terrific save again by the post. Just before the break McAllister looked set to waltz past Smith and score but the goalie stuck out a foot to clear. Was this just not to be the Blue Toon’s day? The action continued to flow towards the home goal after the re-start and five minutes in Stevenson sent a dipping shot from 25 yards over the crossbar. The breakthrough finally came after 57 minutes. A ricochet sent the ball into the path of Jordan Brown and he ran clear to score with a low shot that Smith managed to get a hand on but that had enough pace to cross the line to the left of the goal. Ten minutes later the incessant pressure paid off. A McAllister driven cross from the right side of the area wasn’t held by Smith and the ball broke perfectly for Brown who grabbed his brace from close range. It was three on 75 minutes with a peach of a goal that saw Shane Sutherland, Riley and McAllister combine before the latter coolly controlled the ball, created space and tucked his shot low into the corner. Boss Jim McInally said after the game he was “delighted” with his side’s performance. PETERHEAD: Smith, Strachan, Noble, Ross, Gilchrist, Dzierzawski, Stevenson (Blockley 71), Brown, McAllister, Sutherland (McIntosh 76) Riley (Ferries 79) . Subs (unused): Jarvie, Lawrence, Adams, Baptie.